Four Star Solar builds these power centers starting with OutBack Power's Radian Inverter series and adds on the necessary components such as surge suppression, charge controllers and OutBack's MATE3 monitoring and system control. These systems are fully wired and tested before they are shipped out. 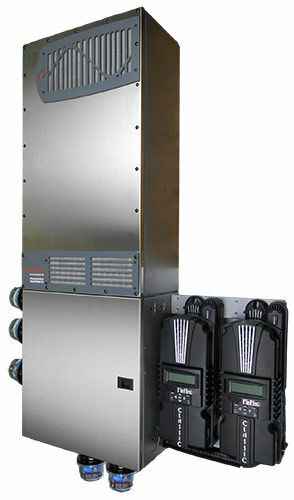 OutBack Radian Inverters are capable of providing power to any off-grid, grid-tied, ac-coupled or battery-backup system. Be sure to click on the inverter options below to view a complete list of components and configurations available. If you don't find exactly what you need, Wholesale Solar can customize any system for you. Give us a call at (1-800-472-1142). Four Star Solar Outback Radian 4048A 4,000 watt w/ no controller Power Center 1440325 4000W 48VDC Sold separately. Four Star Solar Outback Radian GS8048A-01 8,000 watt w/ no controller Power Center 1440324 8000W 48VDC Sold separately. Four Star Solar GS8048A-01 Dual Radian w/ no controller Power Center 1440357 16000W 48VDC Sold separately.